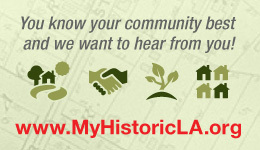 SurveyLA has launched a “virtual town hall” called MyHistoricLA by MindMixer (MyHistoricLA.org). The site lets users create a profile, identify places of historic significance in the City of Los Angeles, comment on ideas, recommend ideas, and earn points towards rewards by participating. 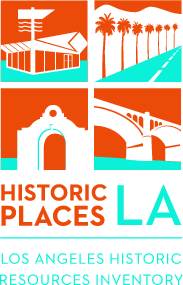 To help you provide information about important historic resources in your neighborhood the OHR has developed MyHistoricLA – an online historic resource identification form. The OHR has also developed a guide, called “MyHistoricLA: Guide to Public Participation in SurveyLA” to help you gather and organize information on important historic resources that you can then provide through the MyHistoricLA form.